The IQ-2103ORL-89 Light Source Module is compatible with both the IQS-500 system and the older IQ-203 Optical Test System. See our other listings for additional modules that are all compatible with the IQS-500 system: IQ-1600 Four Channel Power Meter, and IQ-3200 Return Loss Meter. 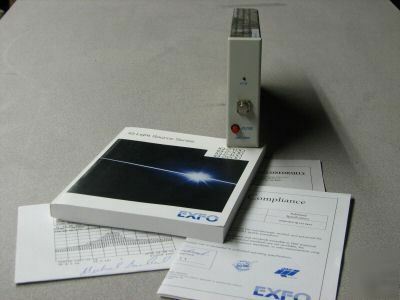 Includes original manual for IQ-2100 series, typical spectrum at 1 dBm, Declaration of Conformity, and Certificate of Compliance. 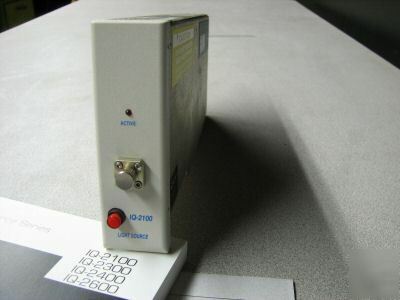 The IQ-2103ORL-89 Light Source Module has and FC/UPC connector, and is configured for optical return loss measurements. Advanced testing environments require a high-performance, stable light source to guarantee accurate and reliable test results. The IQS-2100 offers this and more. Steady drive circuitry maximizes optical output power and maintains excellent stability, while precision optical components ensure efficient low-loss, narrow-beam output coupling. This module light source features an exceptional selection of single- or dual-wavelength, singlemode and multimode light-emitting diodes (LEDs) and Fabry-Perot lasers. This source is an essential building block in many test stations, whether for IL, ORL or PDL measurements of broadband components. The FLS-2100’s ORL option enables optimal return loss measurements at 1310, 1550 or 1625 nm. Reduce interference-related problems when measuring a device’s ORL with EXFO’s large linewidth Fabry-Perot laser, the IQS-2100 ORL Light Source. This source is available at 1310 nm, 1550 nm and 1625 nm for use in EXFO’s modular IQS-500 platform or IQ-200 System. Combine one or many sources with the IQS-3200 Return Loss Meter to create a custom test station.